Mosaic has hosted a special event to celebrate another successful year of its work in the North West at the Manchester offices of PwC, with Marie Mohan, CEO of Common Purpose UK, as the keynote speaker. The event celebrated the wonderful achievements of the region, which this year has served 1670 beneficiaries, with 253 volunteers mentors, across 40 schools and prisons. The evening gave a chance for Mosaic’s mentors and mentees from the North West to meet and talk with members of Mosaic’s leadership team and senior supporters from across the region. Guests were also treated to a very special performance by pupils from Plymouth Grove Primary School, who performed a rap about their experiences of participating in Mosaic’s Primary School Programme. The event also saw the crowning of the North West Regional Mentor of the Year, who will go onto represent the region at the Mosaic Princess Badiya Mentor of the Year Awards. The award was presented to Jodi Hamilton from the One Advice Group, who has been an excellent mentor on the Secondary School programme and has organised multiple world of work visits to her place of work. Highly commended mentors were also celebrated at the event, including Elizabeth Freeman from Manchester Metropolitan University and Amira Badat from OneE Group, who mentored on Mosaic’s Primary and Secondary School Programmes respectively. The event also celebrated the crowning of the inaugural regional Teacher of the Year award, which went to Shahana Ali from Parrs Wood High School, who has been responsible for taking teams from the school to two consecutive Enterprise Challenge Regional Finals. On winning her award, Jodi said: “Mentor of the year – well wow! Thank you Mosaic! For me the whole experience has been very rewarding and I want to say thank you especially to the other mentors at the One Advice Group who have also been involved. We make a great team and I continue to learn a lot about my colleagues because of Mosaic. In fact I heard only yesterday that three of the students we mentored at Newall Green High School have either got apprenticeships or jobs, and that makes it all worthwhile. Thanks to Karl at the school who has been incredibly open and receptive, making the whole relationship work. I’ll be back with more mentors from the One Advice Group next year”. 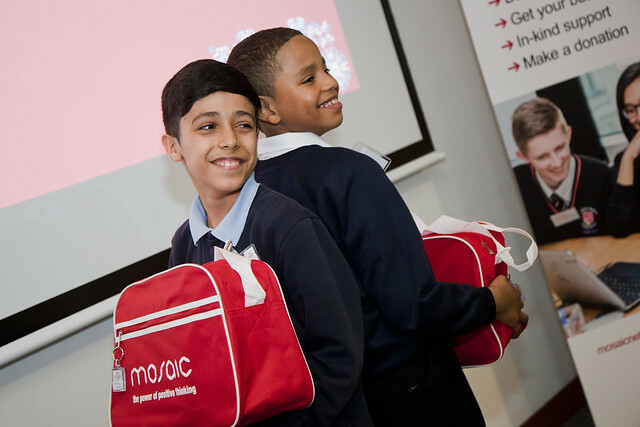 Mosaic runs all of its programmes across the North West, namely its Primary School and Secondary School programmes as well as the Enterprise Challenge and Ex-Offender programme.